Although transport does not, of itself, operate any transformation of the fuel, it forms an integral part of the fuel cycle. Radioactive materials are transported in solid form. The transfer of new and used assemblies as well as radioactive materials and waste is carried out in specially designed containers. The constraints associated with radioactivity vary according to the activity of materials. While new assemblies of uranium fuel emit very little and do not require shielding, the spent fuel and highly active waste require specific precautions. Everything begins with the mine where the uranium is extracted. The mineral is crushed and ground, then impregnated with an oxidising acid solution to dissolve the uranium at a rate of a few grams per litre. The uranium is then selectively extracted from the solution using a specific molecule, which has been used since the 1970s. There then follow several stages of purification before obtaining a mined concentrate of uranium called yellow cake (U3O8). Another mode of operation can also be used: in situ leaching. When the geology is suitable for it, the excavation stage can be bypassed: the uranium is recovered by injecting an oxidising acid solution directly into the deposit and then pumping out the solution. There too, researchers are seeking to remove purification stages by improving the extraction method, which takes place by passing the solution that comes out of the shaft over an ion exchanging resin. In the various factories around world, the yellow cake (U3O8) undergoes an additional purification before being converted into uranium tetrafluoride (UF4), which is then transformed into uranium hexafluoride (UF6) by reaction with fluorine. Then comes the enrichment, where the natural UF6-molecules, containing both the isotopes U-238 and U-235, are separated from each other, to obtain eventually a fraction of UF6 enriched in U-235 and a depleted fraction (0.2 to 0.3% U-235). The first enrichment factories used gas diffusion. Gas ultracentrifugation technology is used nowadays, which consumes 40 to 50 times less energy. Once enriched, the UF6 is further converted into uranium oxide (UO2), the solid used for the production of fuel. The uranium oxide (UO2) is then compressed into pellets at high temperature. These pellets are then inserted into metal shafts (fuel rods). The fuel rods obtained are in turn assembled to form an element, called a fuel assembly. The fuel assemblies are transported to nuclear power stations throughout the world where they are used in a nuclear fission process for the production of electricity. The operations in the back-end of the cycle consist of managing the radioactive materials derived from the irradiated fuel. The back-end of the cycle consists of physico-chemical transformation operations on the irradiated fuel as well as the short- and long-term management of radioactive waste. The radioactivity of materials in the back-end of the cycle leads to the emission of ionising radiation as well as a significant heat output, which dictates all the procedures that are employed. The fuel discharged from reactors is highly gamma and neutron irradiating, because it contains a significant proportion of highly active fission products with a short half-life. The radioactive decay of these elements also gives off significant heat. The first phase of the downstream of the cycle therefore consists of managing the radiation and the heat output of assemblies until radioactive decay causes the elements with the shortest half-lives to disappear. The fuel is first stored at the power plant in the dedicated pool in the fuel building. The water provides the dual function of radioactive protection and heat dissipation. Storage in the water lasts at least a few years in order to reduce the most active isotopes whose half-life is less than this period. The irradiated fuel is thus easier to transport. The irradiated fuel is then placed in a storage site. This stage enables management of flows and heat output until final storage or processing. This storage normally takes place in a pool. Dry storage (in air or an inert atmosphere) is however developing rapidly, as its level of safety is better in the event of an accident that could break the pools. Based on safety demonstrations, storage can be envisaged for periods in the region of 50 to 100 years. After irradiation in the reactor, the waste fuel contains materials referred to as recoverable (mainly partially enriched uranium and plutonium, and small quantities of actinides in certain circumstances) and fission products. The processing of the irradiated fuel consists of separating the recoverable materials from the waste. Depending on the separation process applied, the different actinides can be extracted separately or together. The waste by-products of the processing operation are stored pending a definitive removal solution. 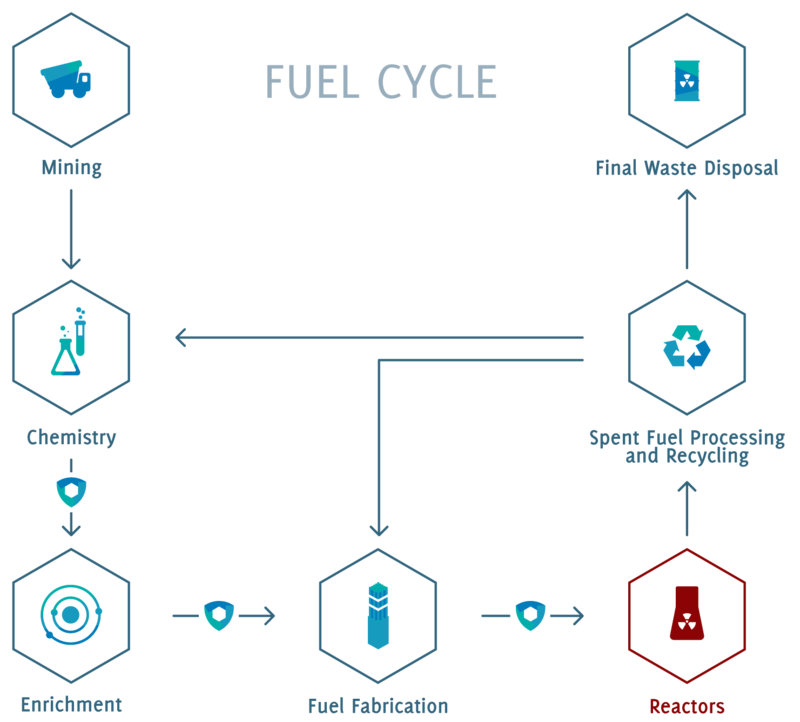 In the context of a cycle without processing, irradiated fuel is treated as waste. This type of storage, which aims for a longer storage period than that which is required for intermediate storage, consists of packaging the radioactive materials into containers and then storing them in structures on the surface or at sub-surface level for a period of centuries or more. During the storage period, the radioactive isotopes decay, which at the same time reduces the activity and heat output of the materials stored. At the end of this stage, the radioactive materials are easier to handle (for possible processing) and less constraining in terms of emission of heat, with a view to storage in a geological stratum. Storage in a deep geological stratum consists of packaging the waste into containers, then storing it in purpose-built subterranean structures. Certain types of waste, such a those with a high level of activity and a long half-life (including, as appropriate, irradiated fuel assemblies) and those of moderate activity and half-life, emit ionising radiation for many centuries or even several millennia. The objective of deep level storage is to ensure the absence of long-term impact of this waste, in a normal or degraded context.